Spinal dural arteriovenous fistula (SDAVF) is frequently encountered accounting for around 70% of spinal vascular lesions. , It is a network of acquired low-flow abnormal arteriovenous (AV) shunts in the dura covering spinal nerve roots, usually supplied by dural branch of a radicular artery and drained by the perimedullary venous system through a radicular vein. Despite being a treatable cause of myelopathy, they are often underdiagnosed because of the non-specific nature of the clinical presentation and lack of awareness of the clinical condition among the practicing physicians. Though first recognized in the late 19 th century, with advances in magnetic resonance imaging (MRI), superselective spinal angiography, microsurgical techniques and endovascular therapy, presently these lesions are potentially treatable. 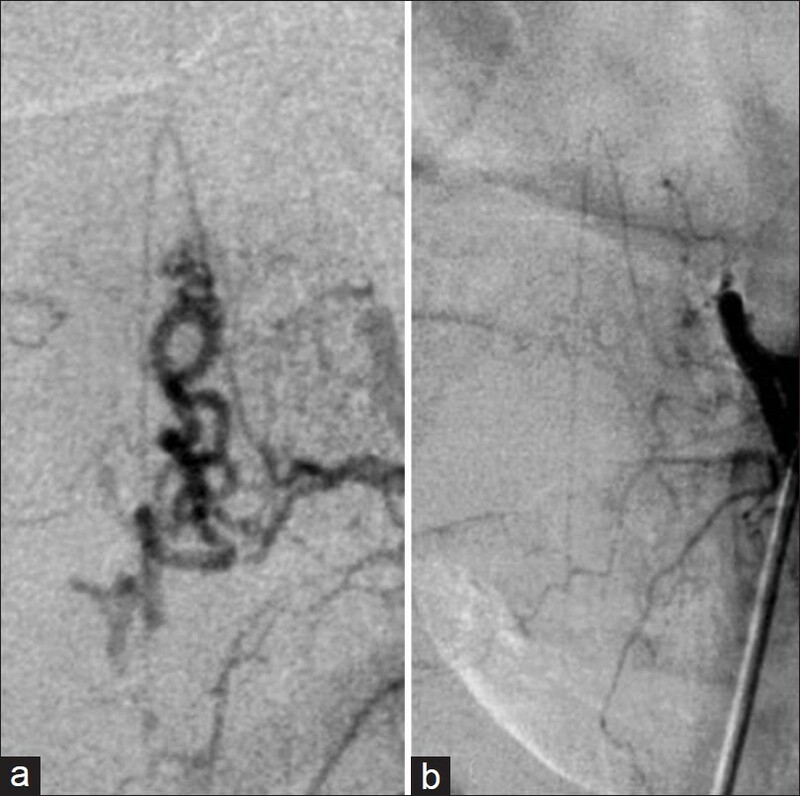 , Even though embolization is increasingly being performed in these lesions, surgical disconnection of SDAVFs is still a treatment option with high success rates. , However, there has not been any published study on the clinico-radiological characteristics or surgical outcome in patients with SDAVF from India. The medical records of patients with SDAVF operated at the Department of Neurosurgery, All India Institute of Medical Sciences, New Delhi, between 1991 and 2005 were reviewed. The treatment modality was chosen after detailed discussions between neurosurgeons and interventional neuroradiologists, considering general physical condition, feasibility of embolization, affordability and patients' preference. Surgical occlusion was the only option in the presence of common origin of medullary artery and radiculomeningeal feeders due to the potential high risk of vascular insult to the cord with embolization and whenever the feeders were too small to be cannulated. Surgery was performed by laminectomy or hemi-laminectomy confined to the level of fistula based either on marker X-ray or image intensifier, followed by limited dural opening. The fistula was identified by tracing arterialized veins into nerve root sleeve, followed by coagulation and severance of arterialized vein. Patients were followed-up with the spinal digital subtraction angiography (DSA) if no improvement was noted. 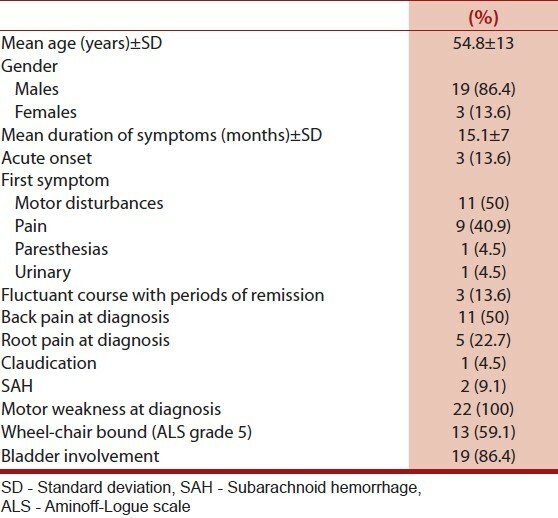 Patients were studied for age at diagnosis, gender, first symptom, symptom onset, progression, history of subarachnoid hemorrhage, exacerbation of neurologic symptoms by physical activity, neurologic deficits, Aminoff-Logue scale (ALS)  and MRI findings. The angiographic studies were reviewed for the spinal level, number of feeding vessels and venous drainage. Patients were also studied for improvement in the gait disability following surgery and also for residual fistula in repeat check DSA. Patients were analyzed for demographic data, clinical and radiological features and neurological outcome in the form of improvement in gait disability grades. Statistical analysis was performed using the SPSS 20 software (IBM Corp. New York). Proportions were compared by using the Chi-square test or Fisher's exact test whenever appropriate. Two sided significance tests were used throughout and the significance level was kept at P = 0.05. There were a total of 22 patients (19 males and 3 females) with SDAVF who underwent surgical ligation. The ages ranged from 30 to 75 years (mean age 55). Out of the 22 patients, 10 patients were in the sixth decade. The duration of symptoms at presentation ranged from 3 to 24 months (mean duration 15 months). Three patients had acute onset while the rest had insidious onset of symptoms. Of the 22 patients, 11 (50%) patients had motor weakness as the first symptom while nine had pain and one each had numbness and urinary complaints as the first symptom. Three patients presented with remitting and relapsing symptoms and the rest had progressive symptoms. Overall 13 (59%) patients were bedridden (ALS grade 5) and 19 (86.4%) patients had bladder involvement at presentation. The summary of clinical profile is given in [Table 1]. All patients had T2 cord hyper-intensity and subarachnoid flow voids in MRI [Figure 1]. Spinal DSA revealed SDAVF at thoracic level in 13 patients [Figure 2]a and in eight patients it was at lumbar location. Venous drainage was predominantly rostral in 18 patients. Of the 22 patients, 16 patients had the fistula on the right side. The radiologic profile is as shown in [Table 2]. The mean follow-up period was 7 months. Outcome was assessed with respect to change in ALS gait disability grade. Overall all patients had favorable outcome in the form of at least non-progression. The 14 patients had improvement in gait disability grade; eight patients had stabilization of neurologic deficits. No one had worsening in the deficits. Of these patients, three patients had residual fistula [Figure 2]b necessitating re-surgery. The subgroup analysis under different categories is as shown in [Table 3]. The improvement was non-significantly greater in patients less than 50 years of age, those with acute onset of symptoms, ambulant at presentation and fistula below T9. 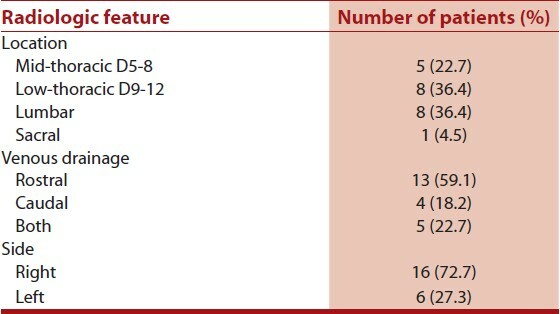 There was lesser improvement in patients with pain as the first symptom and fluctuating clinical course with the periods of remission [Table 3]. Residual fistula needing re-surgery was noted in two patient of the three patients with intermittent symptoms, compared with one of the 19 patients with progressive symptoms (P = 0.04). The most patients in our series were in the sixth decade with men affected 6 times more, these observation are similar to other studies. ,, The long delay of 15 months between the onset of initial symptom and the diagnosis of SDAVF in our study corroborates with a mean delay of 19-24 months in other series, , with the resultant delay in definitive treatment. This is likely because of the nonspecific nature of clinical presentation, which may mimic more common entities such as degenerative spine disease, amyotrophic lateral sclerosis, transverse myelitis or peripheral vascular disease. Complete and permanent fistula obliteration provides the best chance for symptomatic improvement and a favorable outcome. Previously endovascular treatment had lower initial success rates varying between 30% and 90%, depending upon penetration of the proximal vein. Recurrence had been reported to be as high as 23% in studies without occlusion of the proximal vein. ,,, Embolization became more effective with the embolic material successfully occluding proximal part of the draining vein. , Song et al. in 2001 had noted gait improvement in 44% while 56% remained unchanged and none worsened after embolization. A meta-analysis of 10 heterogeneous endovascular studies noted embolization to have 46% long-term effectiveness in achieving shunt occlusion with morbidity of lesser than 4% and no mortality. In one of the largest series to report both endovascular and surgical treatments, Narvid et al. 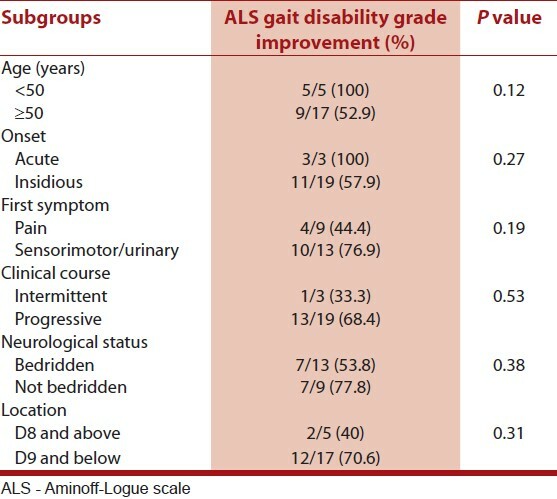 found no statistical difference in ALS scores between the two groups, with both groups showing a significant improvement in gait with intervention (65% vs. 50% respectively). These indicate that if a SDAVF is adequately treated with either surgery or embolization, the outcomes are probably similar. Though minor invasiveness and higher comfort of endovascular treatment in the same setting as diagnostic angiography may appear advantageous in centers with technical expertise, factors such as severe arteriosclerosis, small arterial feeders, arterial dissection due to catheter manipulation and common origin of the anterior spinal artery from the same segmental artery as the feeding artery of the fistula make embolization feasible only in about three-quarters of patients. In addition, the expense involved may not permit embolization in the large section of economically challenged patients from developing countries. However microsurgical ligation is a simple, straightforward, quick, economical, definitive and effective option with minimal morbidity. 1. Krings T, Geibprasert S. Spinal dural arteriovenous fistulas. AJNR Am J Neuroradiol 2009;30:639-48. 2. Jellema K, Tijssen CC, van Gijn J. Spinal dural arteriovenous fistulas: A congestive myelopathy that initially mimics a peripheral nerve disorder. Brain 2006;129:3150-64. 3. Koch C. Spinal dural arteriovenous fistula. Curr Opin Neurol 2006;19:69-75. 4. Thron A, Caplan LR. 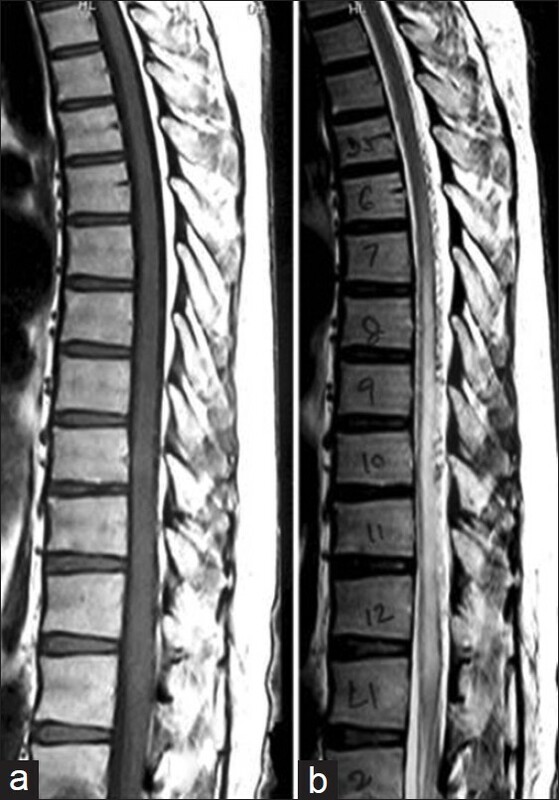 Vascular malformations and interventional neuroradiology of the spinal cord. In: Brandt T, Caplan LR, editors. Neurological disorders: Course and treatment. 2 nd ed. Amsterdam: Academic Press; 2003. p. 517-28. 5. Saladino A, Atkinson JL, Rabinstein AA, Piepgras DG, Marsh WR, Krauss WE, et al. Surgical treatment of spinal dural arteriovenous fistulae: A consecutive series of 154 patients. Neurosurgery 2010;67:1350-7. 6. Narvid J, Hetts SW, Larsen D, Neuhaus J, Singh TP, McSwain H, et al. Spinal dural arteriovenous fistulae: Clinical features and long-term results. Neurosurgery 2008;62:159-66. 7. Aminoff MJ, Logue V. The prognosis of patients with spinal vascular malformations. Brain 1974;97:211-8. 8. Dashti SR, Toledo M, Kim LJ, Spetzler RF. Classification of spinal arteriovenous lesions: Arteriovenous fistulas and arteriovenous malformations. In: Winn HR, editor. Youmans Neurological Surgery. 6 th ed. Philadelphia: Elsevier; 2011. 9. Foix CH, Alajouanine T. La myelite necrotique subaigue. Rev Neurol 1926;46:1-42. 10. Di Chiro G, Doppman J, Ommaya AK. Selective arteriography of arteriovenous aneurysms of spinal cord. Radiology 1967;88:1065-77. 11. Kendall BE, Logue V. Spinal epidural angiomatous malformations draining into intrathecal veins. Neuroradiology 1977;13:181-9. 12. Spetzler RF, Detwiler PW, Riina HA, Porter RW. Modified classification of spinal cord vascular lesions. J Neurosurg 2002;96 (Suppl 2):145-56. 13. Jellema K, Canta LR, Tijssen CC, van Rooij WJ, Koudstaal PJ, van Gijn J. Spinal dural arteriovenous fistulas: Clinical features in 80 patients. J Neurol Neurosurg Psychiatry 2003;74:1438-40. 14. Muralidharan R, Saladino A, Lanzino G, Atkinson JL, Rabinstein AA. The clinical and radiological presentation of spinal dural arteriovenous fistula. Spine (Phila Pa 1976) 2011;36:E1641-7. 15. Aghakhani N, Parker F, David P, Lasjaunias P, Tadie M. Curable cause of paraplegia: Spinal dural arteriovenous fistulae. Stroke 2008;39:2756-9. 16. Steinmetz MP, Chow MM, Krishnaney AA, Andrews-Hinders D, Benzel EC, Masaryk TJ, et al. Outcome after the treatment of spinal dural arteriovenous fistulae: A contemporary single-institution series and meta-analysis. Neurosurgery 2004;55:77-87. 17. Nagata S, Morioka T, Natori Y, Matsukado K, Sasaki T, Yamada T. Factors that affect the surgical outcomes of spinal dural arteriovenous fistulas. Surg Neurol 2006;65:563-8. 18. Fugate JE, Lanzino G, Rabinstein AA. Clinical presentation and prognostic factors of spinal dural arteriovenous fistulas: An overview. Neurosurg Focus 2012;32:E17. 19. Niimi Y, Berenstein A, Setton A, Neophytides A. Embolization of spinal dural arteriovenous fistulae: Results and follow-up. Neurosurgery 1997;40:675-82. 20. Eskandar EN, Borges LF, Budzik RF Jr, Putman CM, Ogilvy CS. Spinal dural arteriovenous fistulas: Experience with endovascular and surgical therapy. J Neurosurg 2002;96 (Suppl 2):162-7. 21. Cenzato M, Versari P, Righi C, Simionato F, Casali C, Giovanelli M. Spinal dural arteriovenous fistulae: Analysis of outcome in relation to pretreatment indicators. Neurosurgery 2004;55:815-22. 22. Jellema K, Tijssen CC, van Rooij WJ, Sluzewski M, Koudstaal PJ, Algra A, et al. Spinal dural arteriovenous fistulas: Long-term follow-up of 44 treated patients. Neurology 2004;62:1839-41. 23. Dehdashti AR, Da Costa LB, terBrugge KG, Willinsky RA, Tymianski M, Wallace MC. Overview of the current role of endovascular and surgical treatment in spinal dural arteriovenous fistulas. Neurosurg Focus 2009;26:E8. 24. Song JK, Vinuela F, Gobin YP, Duckwiler GR, Murayama Y, Kureshi I, et al. Surgical and endovascular treatment of spinal dural arteriovenous fistulas: Long-term disability assessment and prognostic factors. J Neurosurg 2001;94 (Suppl 2):199-204. 25. Westphal M, Koch C. Management of spinal dural arteriovenous fistulae using an interdisciplinary neuroradiological/neurosurgical approach: Experience with 47 cases. Neurosurgery 1999;45:451-7. 26. Song JK, Gobin YP, Duckwiler GR, Murayama Y, Frazee JG, Martin NA, et al. N-butyl 2-cyanoacrylate embolization of spinal dural arteriovenous fistulae. AJNR Am J Neuroradiol 2001;22:40-7. 2 Serum albumin level in spontaneous subarachnoid haemorrhage: More than a mere nutritional marker!